Seeing this, I think I could do it with out a sewing machine, wouldn't look this good, but still, think it might be able to be done. Thanks! Great tutorial! This would make a great gift for someone on your Christmas list. Great idea. It would be a nice addition to thanksgiving table or a side table. Thanks for sharing how you made it. Hi Debbie. Great tutorial. I'm not really into the burlap but see so much of it in blogland! It does look very Thanksgivingy!! You're good too. You are so sweet to do a tutorial! I've been wanting to make one for the longest time but just haven't gone around to it. Now I have no excuse. I have washed burlap before using it for other projects. Have you tried that by any chance before making a runner? i bet the stitch witchery or fusible hem stuff would work. where did you find those brown glasses/goblets on your table?? i have been looking for brown ones. Hi Kim! Surprisingly, there were some little strings...but not a lot of lint! And the goblets were my wedding pattern many moons ago. I have forgotten the name! Sorry. I think it is very kind of you to do a tutorial even though I could not even begin to accomplish this project :-) So hopefully you will continue to make the runners available for sale. I don't know why, but I never got the sewing gene the rest of the females in my family have! If I might add, when I make thinks with burlap I find that if you wash is first it tightens up and is easier to work with and looks better, Now it's sort of messy so you can take it to a laundormat. You did a fantastic job outlining the steps. Hope you are enjoying some beautiful weather. It is cool but sunny here. Perfect! Hi Debbie. Always the professor:)) Love that tutorial. I love the look of this and may try it. Burlap can be funny to work with because it never seem straight.Your's looks beautiful! Stop on by and enter my DaySPring giveaway. Beautiful project! I can't sew, I'm not crafty but I do enjoy stopping by to see what you've done! It's so pretty and creative! Thanks for the tutorial...i might try it even though I don't have a sewing machine. I have an antique server that my grandma gave me and this would look just perfect draped across it. Thank you for the tutorial. Your instructions were very clear and I like that you posted pictures to refer to. 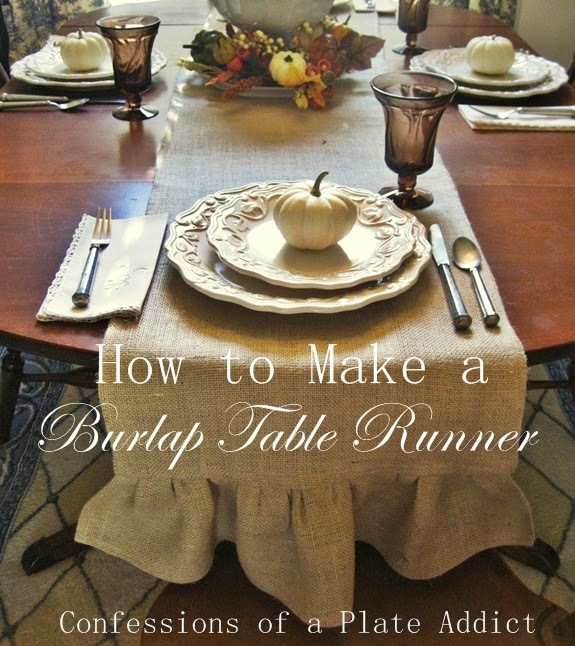 So many wonderful ideas on how to use burlap, I may have to go buy a bolt of it! Thanks for the tutorial! I bought some burlap at HL about a month ago. But it makes me sneeze for some reason! It's so pretty - I think I'll do one for Thansgiving! Thank you for a great tutorial. Congratulations! I really admire you! Cute as all get out...but...I am having enough trouble. Your's looks professional. I haven't sewn in ...ages. What a great job you did on that runner! It's wonderful! Sew? Maybe later..I'll just come and visit yours! Oh, Debbie... what a fun tutorial! You are the best! Thanks! Your tutorial is timely for me. I bought a bag of burlap squares not long ago and want to make some runners. I love your blog and have already bookmarked a bunch. I'll be your newest follower! I am trying this for sure! by the way, I am a plate addict too! I can't seem to get enough! Can't wait to explore your blog! My friend just thrifted a huge bold of burlap! We just might have to make one of these! Love it! I featured you as one of my favorite tutorials from the lettered cottage party! This is my first time visiting your blog and I love it! This burlap tutuorial is perfect timing for me. I've been wanting to make one! Wow, thanks for sharing, I have learned so much here on your site. I love the way how you made the tutorial easy to understand. Its always nice when you can not only be informed, but also entertained! Thanks! Thanks for the tutorial! I found it on Pinterest, and made it tonight. Turned out so cute! Burlap turned out to be a little hard to wrangle, so I ended up sewing more of a pleat than a ruffle, but it still looks darling! Thanks for a great tutorial, Debbie! I found this post on Pinterest and my runner turned out just like yours! I linked to this project in a post I did on my blog (basically telling people just to follow your instructions). Thank you for sharing this tutorial. I LOVE the finished edges. It gives the burlap a bit of 'class'. I have an oval table and I've had decorators tell me you can't do a runner that drapes off of an oval table. Your table proves they are wrong! I hope I'll find time to make a runner for my table soon.